Fifteen awards were announced today in the Fear No Film portion of the Utah Arts Festival, including a Grand Jury Prize, Utah Short Film of The Year, Fear No Filmmaker Award, three honorable mentions and the best short film in each of the seven ‘transitions’ categories around which the film festival was organized as well as two awards in the kids’ film category. Getting Fat In A Healthy Way, Bulgaria: Fear No Film Grand Jury Prize winner 2016, Utah Arts Festival. The Grand Jury Prize for Best of Show went to Getting Fat in a Healthy Way (22 mins, Bulgaria, 2015, Kevork Aslanyan, Georgi Merdzhanov), which is set in the bleak, drab surroundings left from the old Soviet bloc regime where Constantine and his father live. Something catastrophic has happened to the planet’s gravity and anyone weighing less than 260-some pounds floats directly into space. Given that Constantine barely weighs 130 pounds, he is resigned to be imprisoned indoors – at least until a full-figured female airline steward moves into the building. This is the latest prominent award for this film, which already has garnered many honors including FEC Festival (European Short Film Festival, 2016) (Bigas Luna Award for Best Story); Huesca Film Festival, 2015 (Youth Jury Award), and the Sedicicorto International Film Festival, 2015 (Euroshort Award for Best Film). This is the first entry from Bulgaria in Fear No Film’s history. 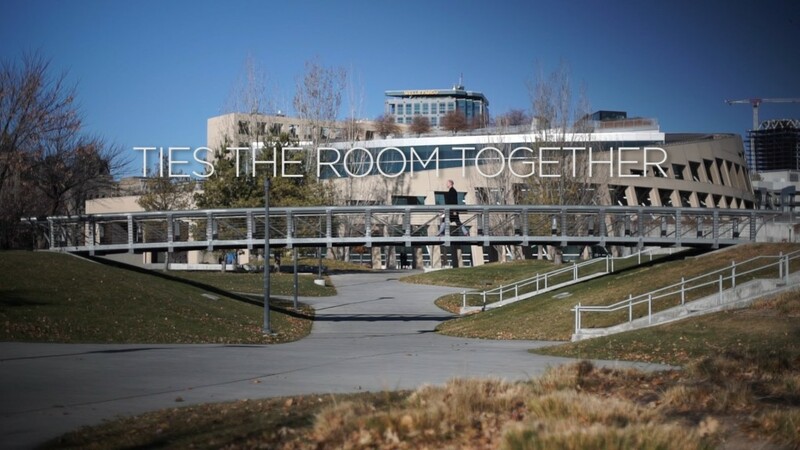 Winning the Utah Short Film of The Year prize is Ties the Room Together (5 mins., created in partnership with VideoWest/KUER, 2015, Joshua Weathers). Two years ago, a film produced for the VideoWest series at KUER-FM also won Utah Short Film of the Year (Transmormon by Torben Bernhard, Travis Low and Marissa Lila). This year’s winning entry takes its title from one of the most quoted lines from the 1998 film The Big Lebowski, the film features Josh Hanagarne, a writer and librarian at the City Library whose 2013 book The World’s Strongest Librarian discusses his experiences with Tourette syndrome. In exceptionally finessed and understated terms, the film captures concisely an impressively comprehensive portrait of Hanagarne as well as the broader humanistic mission of the library – home to Fear No Film and an extraordinarily valuable collaborator in making the Utah Arts Festival as vital and relevant as possible in the creative community. The Fear No Filmmaker Award went to Thumbscrews (5 mins., Canada, 2015, directed by Ghost and written by Kanyanta Alexandre), a sleeper in the festival but a film with all sorts of enigma involved about the illusions of torture and the effects of dreams. Ties The Room Together, Utah Short Film of The Year, 2016, Fear No Film, Utah Arts Festival. Three short films, with solid festival portfolios already developed, also earned Grand Jury Honorable Mentions: What’s a Gender? (9 mins., Netherlands, 2015, Sophie Dros), which explores the identity question with androgynous Dutch twin sisters who articulate very maturely their ideas about expressing gender and discarding once and for all the binary notions of identity surrounding the issue; My Enemy, My Brother (17 mins, Canada, 2015, Ann Shin) about two men fighting on the opposite sides of the Iran-Iraq war during the 1980s, who more than two decades later meet in coincidence on a Vancouver street and forge the bonds of friendship; the Oscar-nominated We Can’t Live Without Cosmos (Mi ne mozhem zhit bez kosmosa) (15 mins., Russia, 2015, Konstantin Bronzit), an animated story of two cosmonauts who have been friends since their childhood years and are hoping to fully realize their dreams of going into space. Fear No Film, held in the City Library auditorium, is the festival’s fourth largest program. Now in its 14th year, Fear No Film, which featured 69 shorts, has come into its own as an international event, attracting a record of more than 500 submissions from around the world. There were 35 films from outside the United States, including seven from Spain and four from the United Arab Emirates. Of the 12 Utah films selected, seven were invited for the Utah Short Film of The Year competition and the other five represent selections from KUER-FM’s VideoWest project, Spy Hop Productions, University of Utah film studies program and a side project from the award-winning animation production center at Brigham Young University. Thumbscrews, Canada, Fear No Filmmaker Award, 2016, Fear No Film, Utah Arts Festival. Personal Transitions:This screening explores how personal change is often dangerous, scary and thrilling. — Last Base (15 mins., Norway, 2015, Aslak Danbolt). Relationship Roles: These stories identify transitions occurring between friends, family and the strangers surrounding us. — Dinner at 40 (18 mins., New York, 2014, directed by Carl Byrd and written by Peter Macklin) and We Can’t Live Without Cosmos (Mi ne mozhem zhit bez kosmosa) (15 mins., Russia, 2015, Konstantin Bronzit). Our Ability to Adapt: In the 21st century, rigidity leaves us behind. These films examine the trickiness, limits and dangers of change. — Time Thieves (Ladrones De Tiempo) (8 mins., Spain, Fran X. Rodríguez). Coping Mechanisms: This program explores a wide range of ways we each cope with transition. — Omnia (8 mins, United Arab Emirates, 2015, Amena Al Nowais). The World Is Changing: From the abstract to the elegantly simple, these films demonstrate how the world is changing. — Getting Fat in a Healthy Way (22 mins, Bulgaria, 2015, Kevork Aslanyan, Georgi Merdzhanov).